Bharti Airtel has extended its promotional fixed line broadband “Airtel Big Byte Offer’ till October 2018. Floated first time in May 2017, Airtel’s limited offer was earlier valid till March 31, 2018, and offered up to 1000GB of additional bonus data with select broadband rental plans. With the extension, Airtel’s new subscribers can still avail extra 1000GB bonus data upon selection of fresh subscription plans. The additional data can be enjoyed at the same speed as per the chosen base plan. The company promises that the un-used Big Bytes data will be carried over each month till October 31, 2018, or till the data getting over whichever is first. 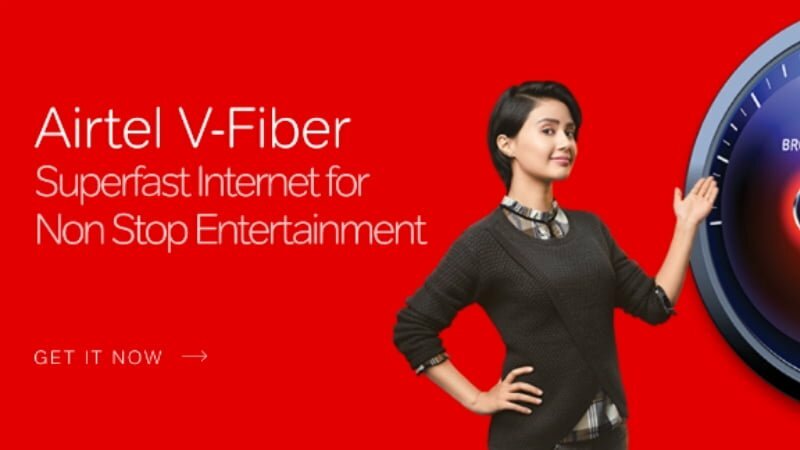 Airtel’s two V-Fiber plans starting from Rs 1099 and Rs 1299 in Delhi region are applicable under this scheme. The “bonus data” being offered is in addition to the base plan quota in each plan. For example in Delhi region, Airtel’s Rs 1099 Plan comes with up to 100 Mbps speed and 250GB of data per month. In addition, the customers get Data Rollover feature that allows one to carry forward the unused to next month. There is also unlimited local and STD calling bundled with the plan. Besides, the Big Bytes 1000GB data, Airtel has also includes a free subscription to Amazon Prime with the plan. Though the plan is priced Rs 1099, subscribers can now get it for Rs 933 monthly rental on six-month advance payment. Airtel’s Rs 1299 Plan offers 350GB of data though the speed remains at 100Mbps. There is Data Rollover, and Unlimited local/STD calling included. Bundled along is once again 1000GB bonus data and Amazon Prime subscription. The broadband plan costs Rs 1299 normally, but as part of Airtel’s promo can be availed at just Rs 1100 upon six advance payment. Airtel says that new customers looking to avail this offer will need to visit their official website ‘www.airtel.in/broadband’ and select base plan, enter mobile number and address to raise a request for new broadband connection. They can also contact customer care representatives to apply for subscription to Airtel Broadband services. The Big Bytes bonus data will be available for use after seven days following the date of activation of new connection as per the company. The user can then enjoy additional data under Big Byte offer, over and above the base plan chosen by them, Airtel says. Furthermore, users can connect their Airtel Postpaid and Digital TV Connection to the existing broadband connection to get another 15GB of additional data. Airtel Broadband customers will also get free Airtel TV subscription. legacy milking of postpaid customers. Already disconnected my airtel broadband 2 months back, speeds are pathetic.